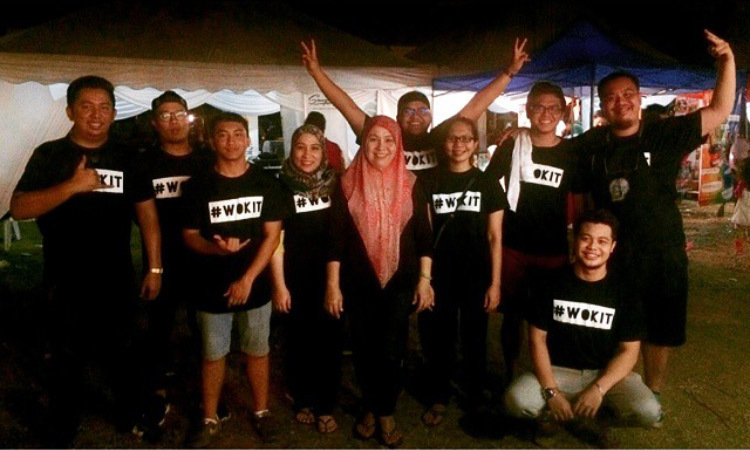 Help Make Wok It Permanent! By purchasing a meal NOW and redeeming it later you will help us in making Wok It permanent! We're happy to announce that we've reached our goal of RM10,000 with 2 days remaining! Thank you to all of you that have supported this campaign with your pledges or by the simple act of sharing this campaign! We owe it all to you, THANK YOU! To reward our loyal customers for all of their support and also new potential customers who believed in what we have to offer. It wasn't just about us, it's also about YOU! 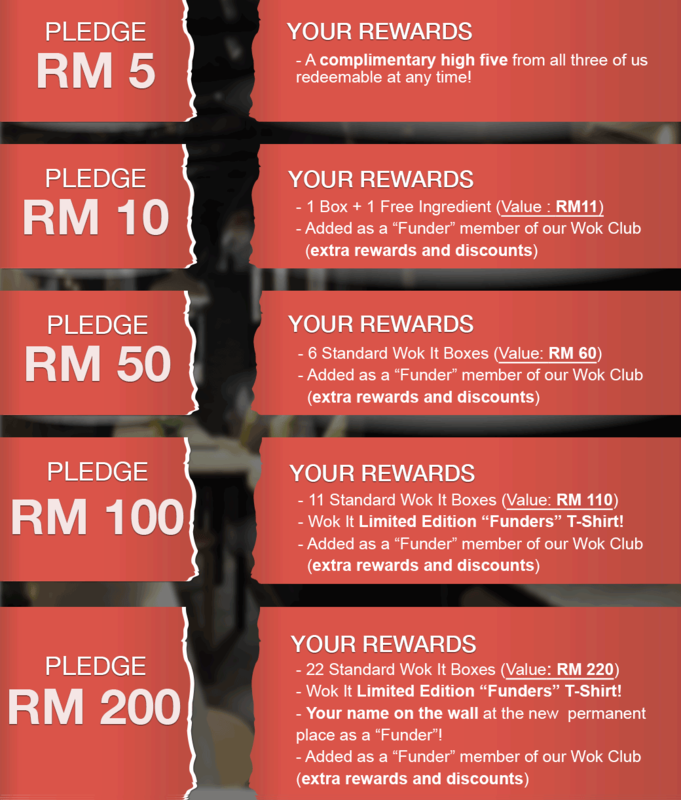 We've structured the rewards so that you could get more value for your RINGGIT plus other cool stuff too! So, with two days to go.. we're aiming to hit RM13,000 at the end of this campaign. Just to entice you a little bit more, we're now putting up the names for pledges from RM50-RM200! 1. How can I redeem the meals I have purchased? We will be handing out gift vouchers (digitally via e-mail) which each entitles you to one WokIt box (RM10 value). 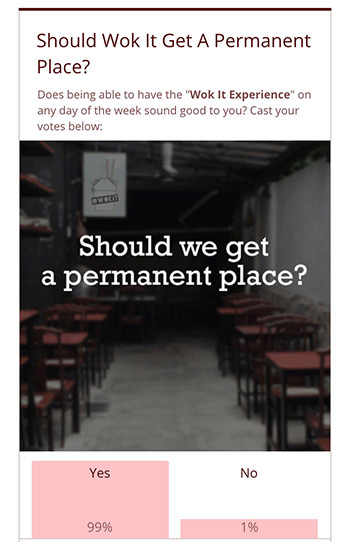 So, for example, if you pledge RM50, you will receive a total of 6 vouchers (worth RM60) which you can use to redeem your pre-purchased meals.You will receive your rewards after we have moved in to Grind 22 permanently. 2. Why are the vouchers sent digitally? It's much more convenient for you. All you have to do is pull out the e-mail from us on your smartphone to redeem. It also makes it easier for you to share it with your friends and family. If you still insist on having it in physical form, you can simply print the vouchers out. 3. What will you do with the money received? The money that you have contributed will go to soure the equipment we need to have our kitchen well-equipped. This includes a 2-Stove Wok Burner, a Freezer/Chiller, a Suction Hood, among others. 4. Why didn't you just go to the bank? To be honest, we did think of that but the idea of it being funded by the very people that has made Wok It into what it today, was simply too awesome to not give it a try. You get to receive more value, while we get to serve you better! Win-Win! 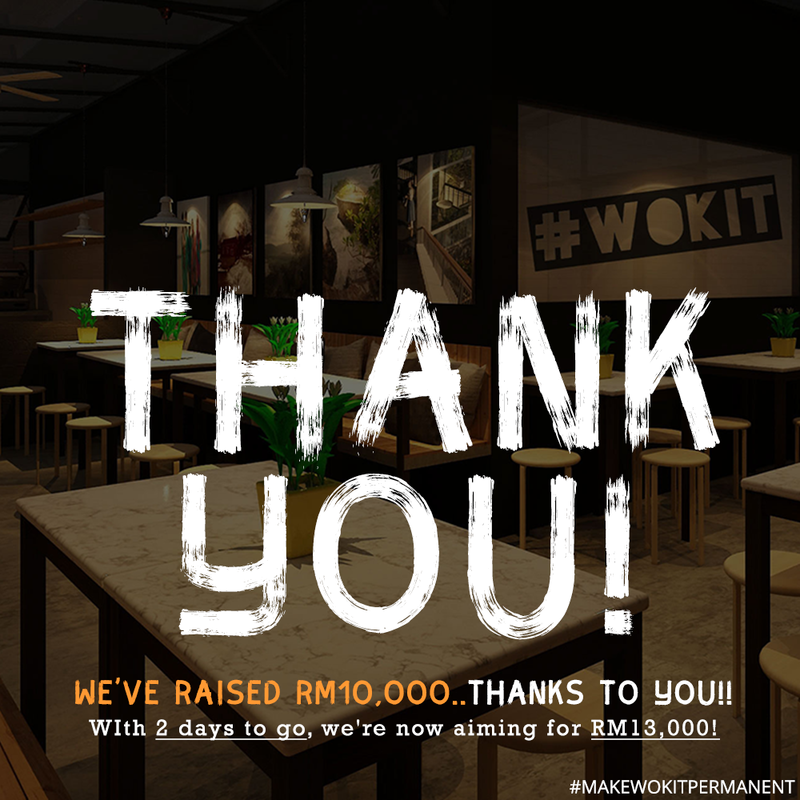 We're currently short of RM10,000 to make Wok It permanent! Rather than going to the bank, we thought of a brilliant idea of raising this amount by going to you - the very people that have shaped WOK IT to what it is today. By purchasing a meal NOW and redeeming it later you will help us with the funds we need to give YOU the "Wok It Experience" on a daily basis, a reality! Here at Wok It, we are guided by the constant feedback that we receive from our customers. Needless to say, countless hours was spent in improving our offerings simply by analysing your feedback. In analysing the feedback we've received, one of the most common requests was for us to get a permanent place. Going by that, we thought it was worth asking our followers again if we should.. The answer was an overwhelming - YES! 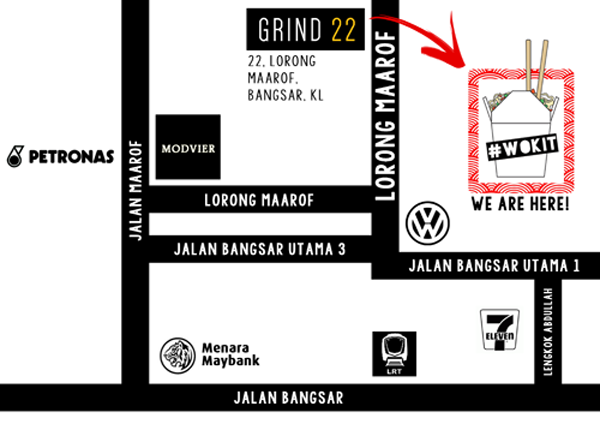 We're working together with Grind 22 who's located at 22, Lorong Maarof, Bangsar to make Wok It permanent! Or you could simply type "Grind 22" into Waze or Google maps, and the voice from your phone will guide you there. 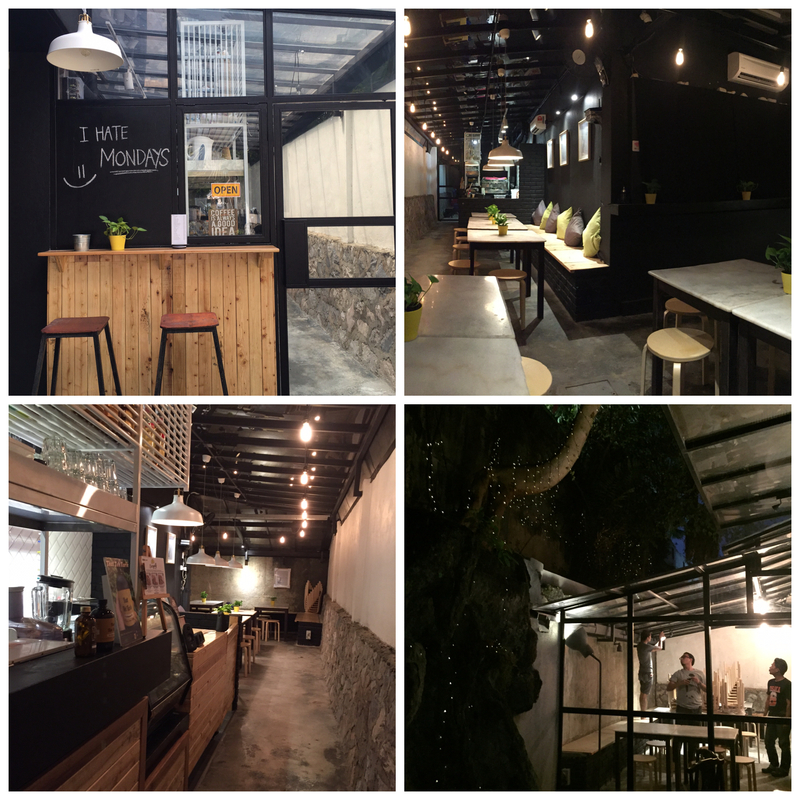 On our Wok Tour last November, one of our pitstops was at Grind 22, Bangsar. That day, we invited a friend to come and shoot random videos for us. Turns out he did an awesome job by asking people if we needed a permanent place. And after watching this clip of what we thought was an invitation from the boys from Grind 22, both of us started talking..
A few weeks later, we had this as the concept of how it's all going to look. Thanks to Inches Design. A month and a half later, here we are with an almost completed project of bringing good coffee, great food, an awesome place and of course, friendly service. While the common areas and the cafe side fully is completed, our kitchen is still a blank canvas. But as with any construction projects, there are bound to be cost overruns. Even with provisions in place, the actual cost still exceeded our initial budget. After doing the numbers, we realised we needed to raise at least RM10,000 to get us across the finish line. 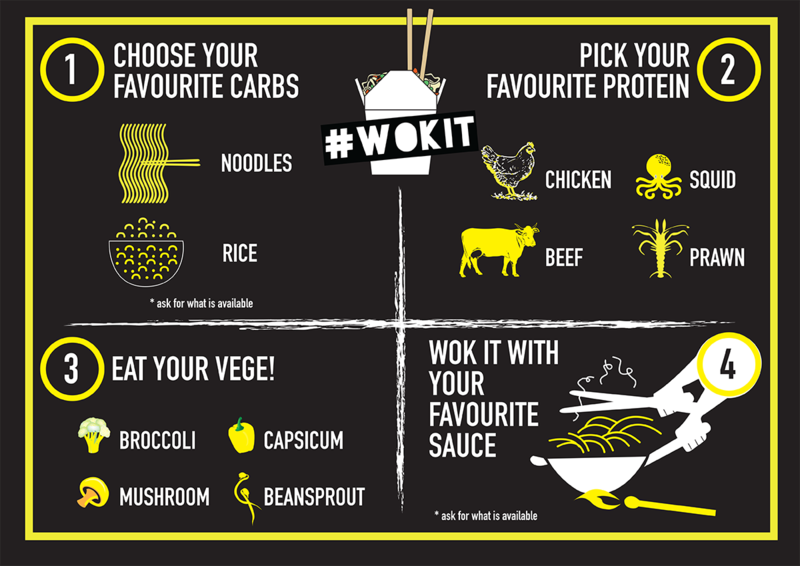 You can help make Wok It permanent at Grind 22, Bangsar by purchasing a future meal TODAY! We're also including a ton of extra value and goodies at every stage of the pledge options! The higher your pledge, the more value and rewards you get in return! Click the big green button at the top of the page that says "Support This Project"
Choose the amount you wish to pledge. Proceed with checkout via Paypal. Don't have a Paypal account? Dont't worry..
You don't need necessarily need a PayPal account to pledge. All you need is a credit card (Mastercard/Visa) or a debit card. All this while getting more value from every Ringgit that you pledge. I Don't Have Enough Money, But How Can I Help? That's okay, any contribution will do. Also, helping us spread the word would help us tremendously already. The more people that know about this project, the better. Just telling your friends helps us get closer to achieving our goals. Every ringgit counts, every contribution helps, and we truly appreciate any help you can throw our way. With your help, we can turn this into a reality! With this menu, there are over 1,000 possible unique combinations that you could make.That means, you could come to Wok It every single day for the next two and a half years and still have something different from the day before! We looked at all the different food concepts in Malaysia and we found that there was one traditional way of cooking that was loved but often underplayed - the Stir Fry! Almost every Asian cuisine has a stir fry element to it, and it's loved by all in Malaysia! We took the perfect stir fry and broke it down into its individual components. And instead of having pre-determined ingredients, we let you build your own perfect stir fry and let us Wok It for you. 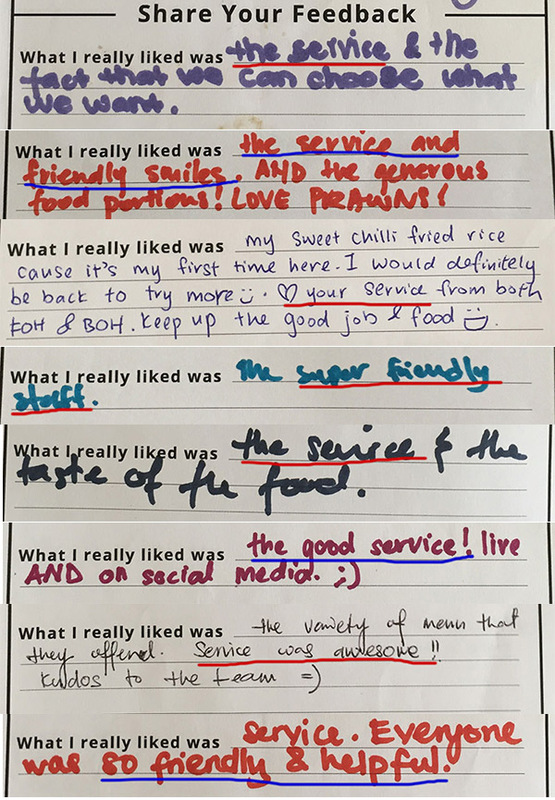 Frustrated with the bad service in most food outlets in Malaysia, we made a promise to ourselves, that we'll be the odd one out - to be known for our good service. At Wok It, we strive to give you the complete package - delicious food and a service that you could smile about! In early 2015, we were three friends who had an idea of jumping into the ever challenging F&B industry. 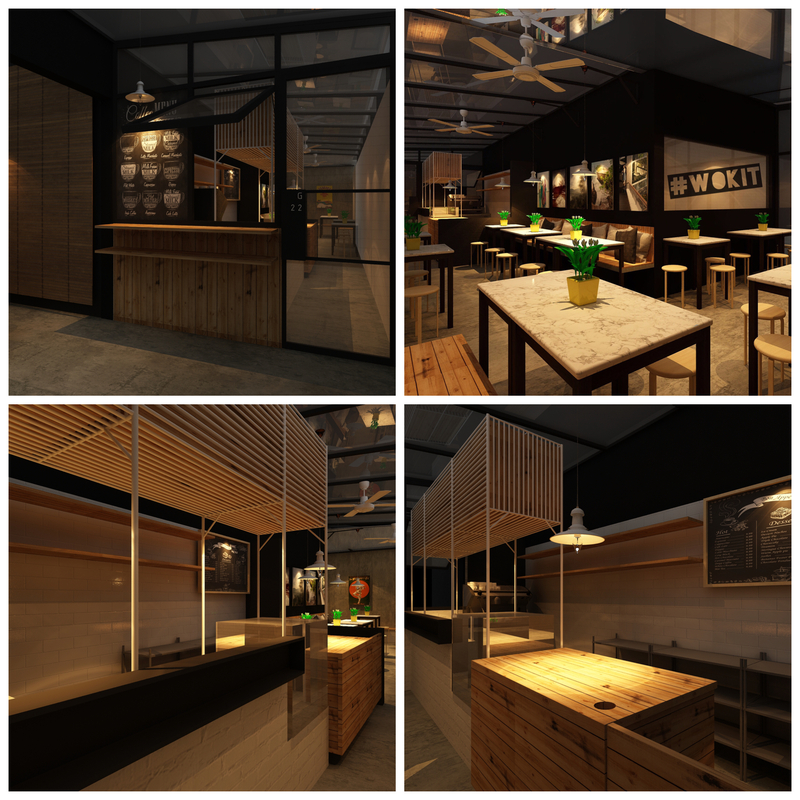 We had a rough idea of what we wanted to do, which is essentially to serve good food with an awesome service to match. Simple. 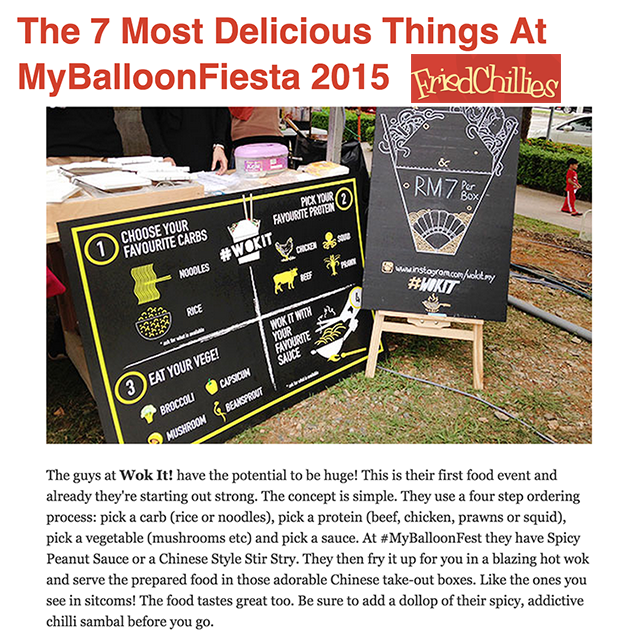 And in March 2015, we went out to test the concept at MyBalloonFiesta/Foodgasm Festival, and it turned out to be a massive hit! We came with only one Wok stove and had to get another on the very first day. Not just that, we also needed as many the manpower as we could. We had 10 people behind the counter at one point just to cope with demand. We were lucky to have such awesome friends who helped us out. We've grown from strength to strength since then.In just under 10 months, we've done 30 events have served 7,001 boxes so far! A big thank you to these people for giving us the space to serve all of you..
We're now charting the course for greater heights in 2016 and beyond..
We hope that you can come along on this journey of ours to serve the "Wok It Experience" to all the foodies like you out there! How can I redeem the meals we have purchased? We will be handing out gift vouchers which each entitles you to one WokIt box (RM10 value). So, for example, if you pledge RM50, you will receive a total of 6 vouchers (worth RM60) which you can use to redeem your pre-purchased meals. What will you do with the money received? The money that you have contributed will go to buying the equipment we need to have our kitchen well-equipped. This includes a 2-Stove Wok Burner, a Freezer/Chiller, a Suction Hood, among others. Why didn't you just go to the bank? A complimentary high-five from all three of us - redeemable at any time! Your name on the wall at the new permanent place as a "Funder"! 1,000 boxes designed to incorporate your branding/message. Promotion on all social media channels. 5,000 boxes designed to incorporate your branding/message.